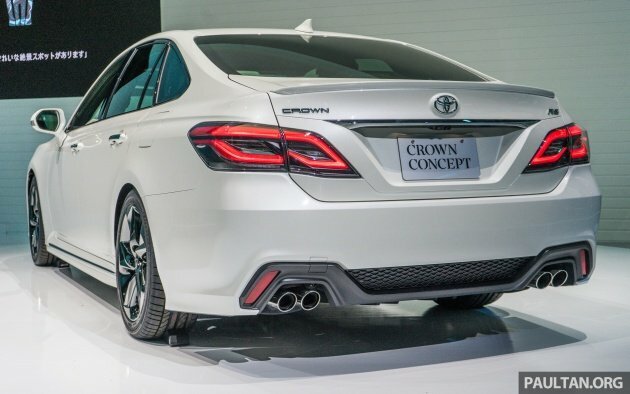 Also on display at the 2017 Tokyo Motor Show is the Toyota Crown Concept, which presages the fifteenth generation of the Japan-only executive sedan. Set to replace the outgoing S210, which has been on sale since 2012, the new model features a more athletic design derived from the new Camry. 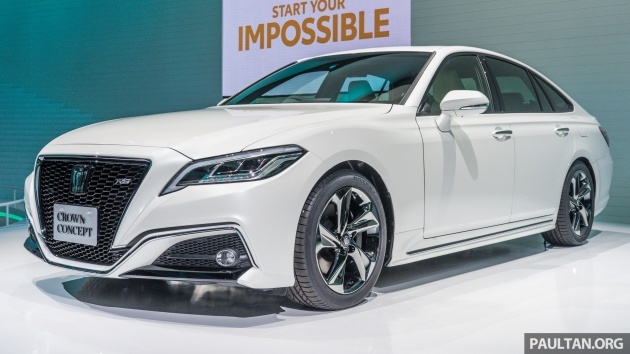 Clear to see is the more curvaceous surfacing and a sleeker fastback-like roofline, as well as a six-window side profile that appears to have been inspired by the new Lexus LS. Up front, there are wraparound LED headlights that frame an evolution of the outgoing model’s full-length grille, while the rear sports broad two-piece tail lights and a large diffuser-like rear valence with quad exhaust exits. The RS badge on the grille (which stands for Racing Spirit, apparently), aggressive front fascia design and large turbine-style alloy wheels suggest that this is a sportier model sitting above the already racy Crown Athlete. The latter should continue to be sold alongside the standard Crown Royal and the longer and more luxurious Crown Majesta. Measuring 4,910 mm long, 1,800 mm wide and 1,455 mm tall, the Crown Concept is 25 mm longer and 5 mm taller than the current model; its 2,920 mm wheelbase is also 70 mm longer, giving it shorter overhangs. The car is built on the Toyota New Global Architecture (TNGA) and is expected to share its underpinnings and plenty of components with the next-generation Lexus GS. Testing at the Nürburgring – which explains previous spyshots at the infamous 20.8 km circuit – is claimed to have imbued the new Crown with responsive handling performance, as well as increased stability both on smooth and rough tarmac and at low and high speeds. Expect the production model to retain the base 8AR-FTS 2.0 litre turbocharged engine introduced on the current car’s facelift, producing 235 PS and 350 Nm of torque and paired to an eight-speed automatic transmission. A 3.5 litre naturally-aspirated should also be offered, similar to the China-only Lexus LS 350 and making 318 hp and 380 Nm, matched to a 10-speed auto. The Hybrid model, on the other hand, will likely receive the Multi Stage Hybrid System from the Lexus LS 500h and LC 500h. This pairs a 295 hp/350 Nm 3.5 litre Dual VVT-i direct-injected V6 with twin electric motors and a 310 V lithium-ion battery, resulting in a total system output of 354 hp. The two motors work in conjunction with a four-speed auto to simulate the feel of a 10-speed gearbox. 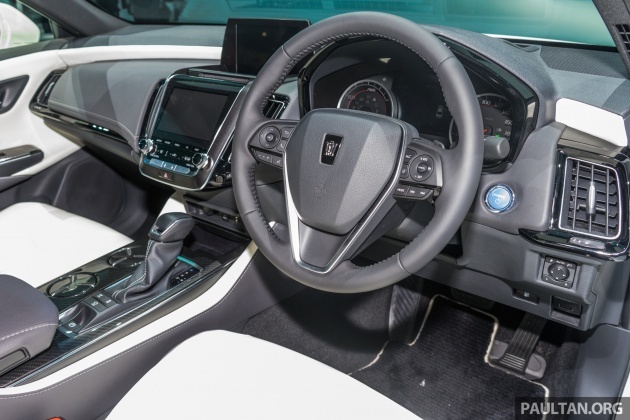 In terms of safety, the new Crown will continue to feature autonomous emergency braking as well as ITS Connect vehicle-to-infrastructure (V2I) and vehicle-to-vehicle (V2V) communication. New to the fifteenth-generation model (yes, really) are Data Communication Modules (DCM) that will come as standard, and mark Toyota’s entry to the Internet of Things (IoT) arena. The company claims that the system collects big data and uses it in different ways, such as reducing traffic congestion and predicting potential vehicle issues, alerting call centres to provide customers with quick and appropriate support. The new Crown is set to go on sale in the summer of 2018. UMWT the maginificent, Bring this in plz. the spacious and luxurious Toyota that no one outside Japan will understand. He he he. If I replace the badge with a Tri-Star & stick a E-Class Crown. I wonder will Merc sue me !? Toyota copied Audi front grille izit?? Why steering wheel copy Hondas?